You do not have to spend a lot of time cooking in order to prepare a healthy meal, but you do need to have some foresight. Every week write down a dinner idea per day. First check your fridge and see what you have leftover. I started my week with left over veggies: carrots, celery, onions all starting to look a little wilted. Put those together in a crook pot with some frozen pieces of chuck beef I had left over from a a Lo Mein, added some potatoes and beef stock and we got stew. Use your favorite beef stew recipe as a guide for seasoning, but don't be afraid to just use what is on hand... that's were stew recipes come from: leftovers. Use any leftover fish: salmon, tuna, a white fillet or a can of crabmeat. Crush up that stall package of crackers you know is lurking in the cupboard. Add: a tbs of hot dog relish, approx. 2tbs of mayo, dash of cayenne, a few shakes of Old Bay seasoning, salt and pepper, the fish shredded up. Beat an egg and add it to the mixture. Stir it up well and make up some hamburger size patties. Heat up a cast iron skillet on medium with a good covering of olive oil. Make sure the pan is hot. Cook patties approx. 3 minutes on each side. Serve with tartar sauce or spicy mayo. I like Boars Head Savory Remoulade. A side of veggie and some rice or potatoes. This I had frozen. Whenever I make quiche I make more than one. They are a great thing to take out on busy days when you don't have time to cook or need a dinner that can sit around and people can eat it at different times. Again quiche, like soup, or stew is something I make with leftover veggies and cheese that is aging. Yes, if there is a little mold on cheese you do not need to throw it out, just cut off the mold and chop up the cheese. Put it in the bottom of a browned pre made pie crust, add veggies: broccoli, spinach, asparagus works well. Beat about 6 eggs per pie with about 1/4 cup of milk or cream (leftover 1/2 and 1/2 works well) with a pinch of nutmeg or paprika, salt and pepper. Pour into the pie shell and cook on 375 for about 30min. Check it with a toothpick. You can take it out a little early, egg keeps cooking. Cool for at least 7 minutes before you cut it. Service with a salad. A really busy day, grab that jar of red sauce. I buy Rao's Homemade it is expensive but it really reminds me of homemade sauce, which as an Italian-American I grew up eating. My mother can't believe I don't make my own sauce. I do occasionally, if we grow a lot of tomatoes, but jar sauce has come a long way. For pasta I use Barilla Plus it is a multi-grain pasta that is much more nutritional than regular pasta but it has a normal consistency, unlike whole wheat pasta. For meatballs I like Trader Joes' Turkey Meatballs. They don't have additives and they are lower fat and calories than beef meatballs. You can throw some leftover veggies into the sauce and instead of meatballs you can used whatever meat you have leftover. Dried meats work well too, like salami and prosciutto. Pickled vegetables and olives are really great to add to tomato sauce, so is a can of tuna fish, very Sicilian. As a former vegetarian I try to make as many meat free meals a week as I can. My kids have always eaten beans. I think most kids really don't mind their taste. They are used to them in chili and Mexican food. If your kids are new to beans you can brown up some ground beef and add it to this meal. I just open up a can of black beans, heat them up in a sauce pan and add spices. You can put a jar of salsa that you have open in the fridge, or some cajun spice, any thing you like, got some left over red wine, put a splash in there. Cook up some rice, I like quick brown rice. It has so much more fiber and nutrients than white rice. Top with some sour cream or guacamole. Thanks to your post I made a quice yesterday. I added a bit too much broccoli and not enough eggs though. I use to love quice, and have just started making them again. You really don't need to add very much veggie, or even cheese for that matter. But the egg should fill the crust completely. I love doing this! I am NOT a heat up the same meal twice person - yuck! But I love using my leftovers in other recipes. Thank you for the fish cake recipe. Whenever we have fish, any leftovers are tossed :(. I have been thinking for a long time that I need to look into fish cakes. Because the crackers are already seasoned they add so much taste to the fish cakes. They really can be stall too. I love that I don't have to waste old crackers. 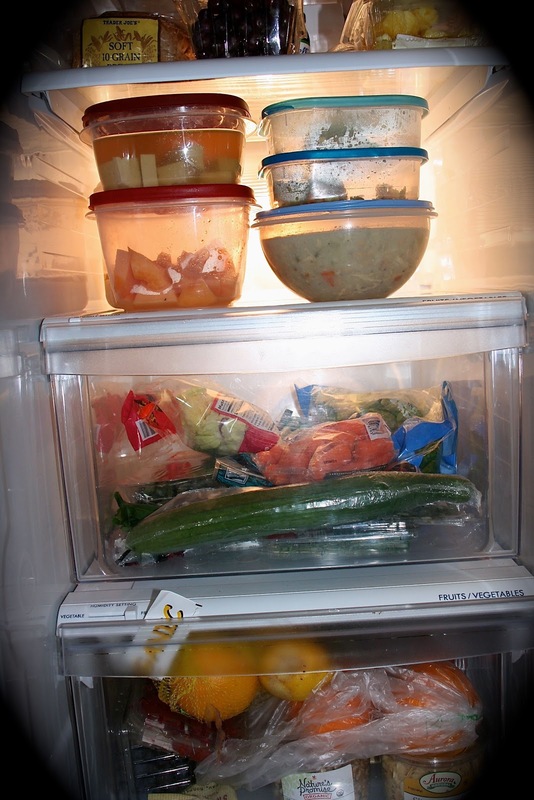 I love using leftovers in new ways - my family hates leftovers and so it is really a necessity! The fish cakes sound amazing! I make my spaghetti sauce from scratch and it is where I put little bits of all sorts of veggies - it always cleans out the fridge! I just love your awesome ideas. I always love to plan my leftovers and have some really awesome meals from the leftovers. I am always excited to see others learning this art of saving time and money. Thank you so much for sharing with Full Plate Thursday and have a great week end. Thank you so much. I was very happy to find your blog. There are some really good recipes to be found in your Full Plate Thursday. I would love it if you could share some of yours on my Foodie Friday linky. I have a big jar of hot dog relish from a picnic that probably won't get used , any ideas for leftovers? Maybe a marinade or sauce?